Editor’s Note: Santa Claus already has come down the chimney, and the New Year has come and gone. 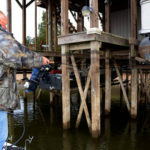 Most crappie fishermen have their poles-rolled up and put under their porches, but not Whitey Outlaw of Gadsden, South Carolina, who fishes year-round., Although the Sunny South is enjoying some warmer weather at times, the rest of the country still has cold water and weather. Here’s how Outlaw finds crappie and how he catches them then. There are many reasons that crappie fishermen don’t catch crappie in the wintertime. Here are the biggest reasons I think most crappie fishermen don’t catch crappie in the winter, and what you can do to solve these problems. *Don’t fish too fast. Most crappie fishermen fish too fast during the winter. The crappie’s biting metabolism has slowed-down at this time of year. They don’t want to chase a bait, they are not going to move very much, and if you get in a hurry, they won’t be in a hurry. So slow-down your fishing, realize that you can’t fish as fast as you do during the spring, summer and early fall, and you will still be able to catch crappie in the winter. *Change up your line and baits. Most crappie fishermen use the same size line to fish in the winter as they do the rest of the year. When the water is cold, I’ll fish 6- and 8-pound-test line. I believe the crappie can see the line better in the winter months, and you have to use lighter line to fish deeper. If you’ll back off your line size and respool your reels with lighter line, you will catch more crappie. 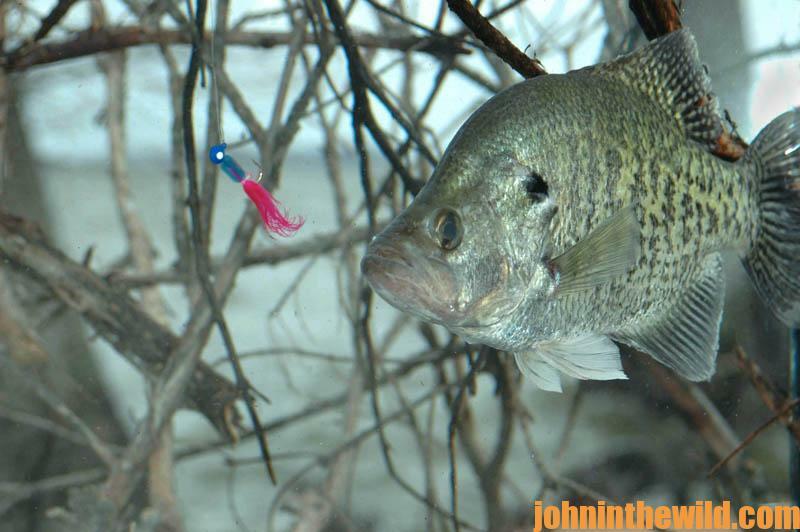 Often crappie fishermen use baits too big in the winter months. 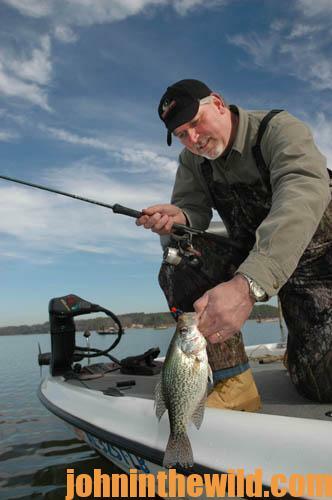 Crappie aren’t eating as much as they are during other seasons, and they prefer small baits. If you’re fishing jigs, fish with a 1/32-ounce jig, or when fishing with minnows, use medium- to small-sized minnows. *Identify the most-productive sections of a lake for wintertime crappieing. Another possibility is that you are fishing the wrong area of the lake. Most crappie fishermen in the winter fish the mouths of creeks, assuming that the crappie are holding there, waiting on warmer weather to actually move into the creek and up the creek channel to reach to the spawning grounds. They’re also probably fishing in the backs of creeks. 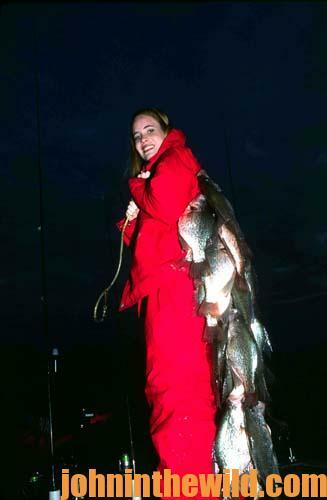 Then they can get out of the wind and fish without being beaten-up by high waves and rough water. But to catch crappie in February, you will have to fight the wind. I like to be out on the main lake in that rough water, fighting the wind and catching crappie. Too, when you fish the old river channel out on the main lake, rarely will you ever see another crappie fisherman out there. When you locate crappie on these old river channels you can often go back to those same places for several days and continue to catch crappie. *Don’t give up. Often many crappie fishermen are quick to quit. If they’re not catching fish within an hour or two, they’ll roll up their poles and head home. But crappie don’t bite all day long during the winter months. To catch them, you have to be there when they decide they want to bite. Therefore, decide to stay on the lake from daylight to dark. If you put in the hours and find the fish, they will bite at some time that day. All you really have to do to catch them is be there when they want to bite. *Use your electronics. Yet another possibility may be that you’re not using your electronics enough. Your depth finder is your eyes under the water. Learn all you can about what it is telling you. Experiment with it. Many times when you look at a depth finder, you’ll see it marking fish, stumps, logs or trash on the bottom. 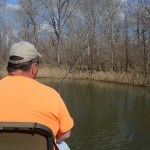 Then you may say to yourself, “I don’t believe that depth finder is telling me the truth.” So, investigate with your fishing tackle to try and learn exactly what that depth finder is telling you and how the information you are getting from that depth finder relates to your ability to catch crappie. 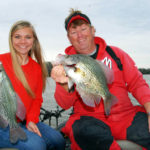 Once you learn how to understand the information the depth finder tells you, then you will know what types of locations produce crappie, what a school of crappie looks like on the depth finder, and often whether that school of fish will or will not bite. Fishermen just now are beginning to learn to interpret all the information that a depth finder can provide. I promise you, the more you learn about what that depth finder is telling you, the more crappie you will catch. *Fish with the correct equipment. I like a 14-foot pole. The 14-foot pole allows me to get further away from the boat and spook fewer fish. The pole has enough backbone in it to allow me to fight really-big fish, get them up from deep water and put them in the boat. In cold weather, I fish light line, little minnows and deep water and depend on my electronics. If you don’t have the right equipment, then you can’t expect to catch as many crappie in cold weather as the people do who have the right equipment. *Get a lake map from one of the companies that map the bottoms of lakes around the U.S. Many crappie fishermen don’t believe they need a map of the lake. A good crappie fisherman who knows how to catch crappie during the cold weather lives with the lake map. This map allows you to quickly and easily locate river channels, creek channels, drop-offs and ledges. If you don’t know where the structure is that holds the crappie, you can’t catch them. 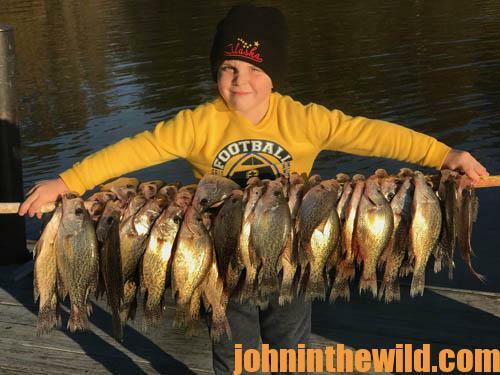 If you find crappie, for instance, on the edge of a drop-off 16-feet deep in the lake, and those crappie quit biting, you need to know where there’s another drop-off that is 16-feet deep where you may find another school of crappie on the day you’re fishing. Crappie are patternable in cold weather. When you establish a pattern, you need to know where you can run to other places in the lake and locate that same type of water and that same depth of water. The lake map will give you that information. If you don’t have and use a lake map, you won’t find and catch as many crappie as other fishermen do. *Use a GPS (Global Positioning System). You won’t catch as many crappie, if you’re not using your GPS. If I catch one or two nice fish on a place I’m fishing, I quickly mark that location as a waypoint on my hand-held GPS receiver. Once I have that location marked, I will return to that same spot maybe two or three times during the day. That GPS spot that I’ve marked tells me where the crappie are. If I keep returning to where the school is located, at some time during the day, that school has to feed. So, if I fish that school two or three times during the day, I’ve drastically increased my odds of having my bait in front of the fish at the time they want to feed. The hand-held GPS receiver will consistently put crappie in your boat. Another advantage to using a GPS to mark spots where you catch crappie is that the crappie have been in that location for a reason. There’s something in that area that is holding fish, perhaps a brush pile, a stump, a log, a place in the bank or a spot where baitfish for some unknown reason just like to hang out. 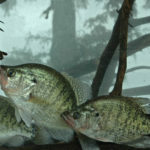 But regardless of the reason, if you catch one crappie at that site, there’s a very good chance that the next time you return to that place, a crappie will be there. *Don’t only fish in deep water. Another mistake is you may have fished in deep water for too long. During the winter months, although crappie historically hold in deep water, late in the afternoon when the water warms up, those fish often will move up out of that deep water on to the top of the ledge, in 8 to 10 feet of water. If you’ve caught crappie in 20- to 30-foot-deep water and you don’t know to look for crappie in that 8- to 10- foot range later in the afternoon, you won’t catch crappie in the afternoon like you have in the morning. When the sun is shining all day, the water will be warmer in the afternoon than it is in the morning Then as that water warms up, the crappie will come up from the deep water to the shallow water. 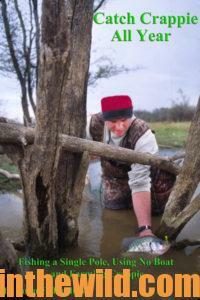 Learn to look for the crappie in more-shallow water in the afternoon than in the morning. *Use colored jigs. Don’t be afraid to put some color in the water. Often at this time of year the crappie want a little color with their minnows or want jigs tipped with minnows. Sometimes a little flash of color, a little sparkle, a little glitter, a little chartreuse will make those crappie bite when they won’t bite a minnow with no color. So, experiment with jig-and-minnow combinations using different colors. Anything you can do to help the crappie see or smell your bait often will be the difference in whether you do or don’t catch crappie. Remember that crappie fishing is like coaching a football team. You have to run different plays to determine what’s working, and you may have to change your whole game plan and try something new or different to make those fish bite once you locate them. 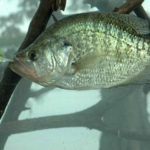 But crappie are in the water, they have to eat at some time during the day, and all you have to do to catch them is to be where they are, when they want to eat with a bait they will eat. 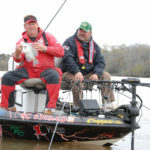 To learn more about crappie fishing, see John E. Phillips’s books in Kindle, print and/or Audible forms, including “Catch Crappie All Year: Fishing a Single Pole, Using No Boat and Farming Crappie” (http://amzn.to/1DBpnNh). 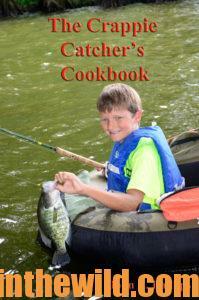 To receive and download for free “The Crappie Catchers’ Cookbook,” by John and Denise Phillips, go to http://johninthewild.com/free-books.